“Liberation,” Camila Chávez, César Chávez’s niece, said, “is about being what you want to be and loving who you want to love.” She paused, and her words hung over the crowd in the dim room. “Without persecution,” she added. 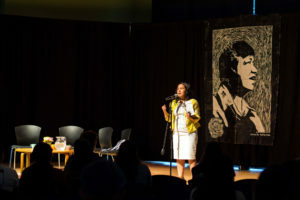 About 100 people gathered at the 14th annual César Chávez Convocation held in the College Nine and Ten Multipurpose Room on May 16. Presented by the Chicano Latino Resource Center, College Ten CoCurricular and the Dean of Students Office, the convocation created a space to remember César Chávez and the legacy of social activism he left behind. César Chávez, co-founder of the United Farm Workers labor union, was a labor leader who paved the way of bettering conditions for agricultural workers. He organized nonviolent pickets, rallies and marches that unified laborers and supporters to make social change. Every year the event features speakers who strive to exemplify the same values of social justice César Chávez embodied during his lifetime. 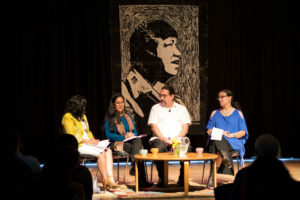 This year’s panel included Mireya Gomez-Contreras, Paul Ortiz and Camila Chávez. Each speaker brought their perspectives on what social justice movements are really about and how to become an active participant in them. Gomez-Contreras is a community activist in Watsonville and a program director at the Community Action Board of Santa Cruz County, Ortiz is the director of the Samuel Proctor Oral History Program and an associate professor of history at the University of Florida and Chávez is the executive director of the Dolores Huerta Foundation. The three expressed their different interpretations and advice for social activism. While they are each at the heart of the workers’ movement spurred by Chávez, they spoke broadly about activism for the UC Santa Cruz audience. Gomez-Contreras said it is critical to own your identity and respond with action in order to protect it. This can be more than just the individual and she said people with similar identities should unify and respond with action in order to protect their identities together. Ortiz emphasized the importance of family, caring and solidarity when organizing movements and demonstrations. He said he believes attendees interested in making a change should reflect on these values to truly understand what it means to be a social activist. Ortiz played an active part in organizing both the Chateau Saint Michelle Wine Boycott and the Mt. Olive Pickle Boycott. Both actions stirred change in hopes to end poverty among farmworker families. He advised students interested in activism to accept and encourage intersectionality and to let the shared struggles of different groups unify each other for a common cause. While Ortiz underscored what values drive social justice movements, Camila Chávez talked about adding tools to your activist tool set. Chávez taught the audience ways to actually get involved, by joining organizations, interning and volunteering. She also stressed the importance of civic engagement and holding elected officials accountable in order to induce change. Chávez said she believes people shouldn’t hesitate to contact their elected officials about community concerns. She also said she believes anyone is capable of social change and that there is hope for everyone, no matter what circumstances they come from. Chávez also emphasized the importance of communication between community members ­— the first part of organizing a movement. Once people start communicating, Chávez said, they learn they feel similarly about certain things and this unifies them. She added that communication also leads to different perspectives on how to solve the issues at hand.